Subatomic Studios has gone to the big screen with Fieldrunners for iPad. This second wave is a complete reworking of the original and expands on its amazingly addictive and visually astonishing Tower Defense adventure masterpiece. After winning a handful of awards and capturing millions of fans on the iPhone and iPod touch, Fieldrunners is going to do the same for iPad fans. This version has super clear and HD quality graphics, better effects and an improved soundtrack. The price is starting at $7.99 compared to the $2.99 iPhone version. We’re not sure if Fieldrunners for iPad will also have in-app purchase features which have not been too popular with old school Fieldrunners fans. We will do a full review Saturday. 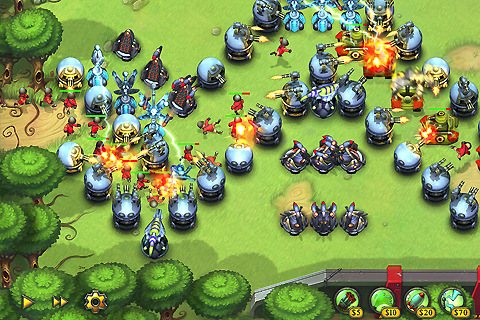 AppSafari review of Fieldrunners for iPad was written by Joe Seifi on April 2nd, 2010 and categorized under App Store, Featured, Fun, Games, iPad apps, Tower Defense. Page viewed 3501 times, 2 so far today. Need help on using these apps? Please read the Help Page.